Guess who’s turning three? (Hint: it’s me, Paper Pumpkin.) 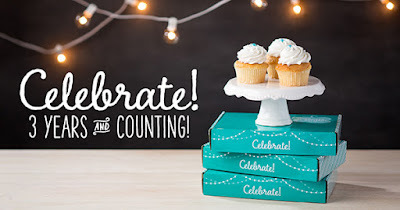 Celebrate with a limited-edition box for your March kit. To receive March's Kit, be sure to sign up by the 10th of March. This was a recent announcement made by Stampin' Up! but if you don't regularly check out the Paper Pumpkin Blog or Facebook page you might of missed it. If you are already a subscriber you will receive this limited-edition box for your March kit. If you still haven't tried Paper Pumpkin you can click the link in the upper left hand column of my blog to sign up. And, remember during Sale-a-bration you can get a 3 month prepaid subscription at a discount. Feel free to send me an e-mail at Eilang56@aol.com if you have any questions, or leave a comment below and I will get back to you. If you signed up for any of the prepaid subscriptions remember to check for an e-mail that will give you the code and link to finish your registration. After that the kits will come to you each month and you don't have to do anything else but sit back and enjoy your products.